XPOWER Axial Fans have a unique grill design that provides powerful ventilation by allowing airflow to be focused up to 60 feet. Highly durable axial fan design includes a sealed motor and rugged ABS or ABS and PC housing. Unit stand/rack allows for a 360 degree fan rotation, creating maximum drying flexibility. Models X35-AR and X48-ATR are designed for high temperature environments and can withstand room temperatures up to 180°F. 16" Duct Hose and Duct Hose Adapter Kit available for use with for use with X-47ATR and X-48ATR. XPOWER Axial Fans have a unique grill design that provides powerful ventilation by allowing airflow to be focused up to 60 feet. 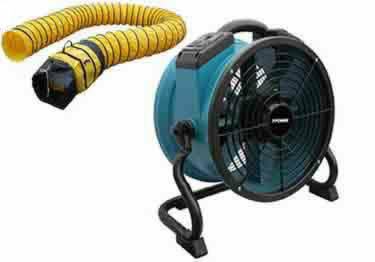 Highly durable axial fan design includes a sealed motor and rugged ABS or ABS and PC housing.